This week, Syracuse University welcomes one of the most academically competitive classes it has recruited in the institution’s history. That’s evidenced by a 17-point jump in the average SAT score—from 1254 last year to 1271 this year. Additionally, the University continues to see growing interest from students—domestic and abroad—who want to pursue a Syracuse education. In fact, nearly 35,000 high-achieving students applied for admission this year, an increase of more than 1,800 applicants over the previous year and an all-time record high. Students gather at the Hendricks Chapel Ice Cream Social during Syracuse Welcome 2018. Chancellor Kent Syverud says the increasingly diverse group of students—from around the nation and the globe—demonstrates the University’s ability to anticipate and meet the evolving needs of today’s college students. Ryan Williams, vice president for enrollment services, says Syracuse University is increasingly attractive to students looking for a challenging, promising and highly personalized academic experience. Joining the Syracuse University community is a talented group of students bringing continued diversity to an inclusive and welcoming campus. 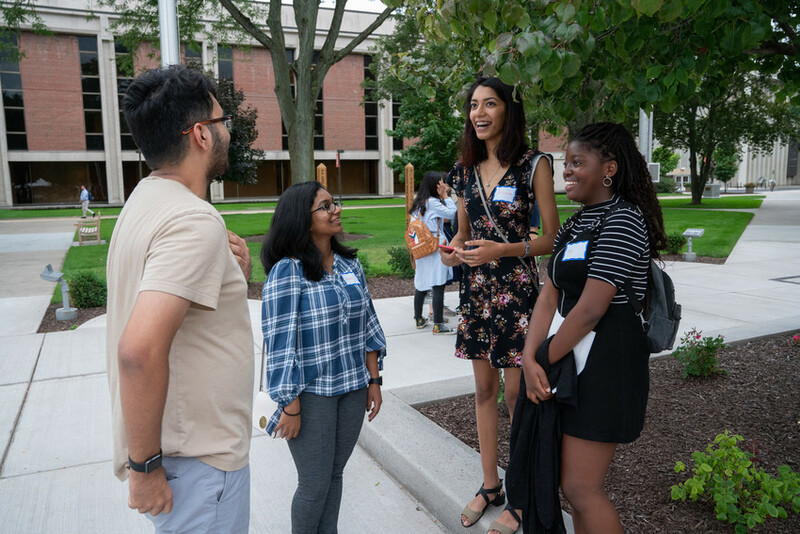 In fact, 26 percent of the new first-year class are students of color; 18 percent of incoming students are first-generation college students; and roughly 75 percent of Syracuse students are receiving some form of financial aid. New students represent 48 states, along with Washington, D.C., Guam and Puerto Rico. Nearly 600 international undergraduate students representing 59 countries are joining the Syracuse University community this year. Syracuse University is a private, international research university with distinctive academics, diversely unique offerings and an undeniable spirit. Located in the geographic heart of New York State, with a global footprint and nearly 150 years of history, Syracuse University offers a quintessential college experience. The scope of Syracuse University is a testament to its strengths: a pioneering history dating back to 1870; a choice of more than 200 majors and 100 minors offered through 13 schools and colleges; nearly 15,000 undergraduates and 5,000 graduate students; more than a quarter of a million alumni in 160 countries; and a student population from all 50 U.S. states and 123 countries. For more information, please visit http://syracuse.edu.